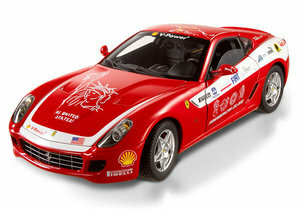 Ferrari 599 GTB Red Pan Am 1/18 Scale by Hot Wheels ELITE Edition , $99.99 at Modena Motors Inc. The Ferrari 599 GTB debuted at the Geneva Motor Show in February 2006. It takes its name from the Fiorano circuit Ferrari uses to hone the performance of its track and road cars. ‘GTB’ stands for ‘Gran Turismo Berlinetta’ and ‘599’ is the displacement of the V12 engine divided by 10. The car was designed with several objectives in mind: to increase driving pleasure; to guarantee performance; and to ensure comfort, ergonomics and safety. It is a concentration of Ferrari’s most innovative and technologically advanced engineering solutions applied to a front engined two-seat berlinetta. The all-aluminum construction technology for the body and the chassis made it extra light. That, with the powerful engine which produces 620hp at 7,600 rpm, the car obtains a weight/power ratio of just 2.6 kg per horsepower. A mixture of soft curves, sharp creases and a few challenging details that take a little time to fully appreciate, the body of the car integrated advanced aerodynamic solutions and performance figures with a beautiful Pininfarina design. These two Hot Wheels EliteTM models reproduce the two 599 GTB used during the latest and most persuasive test of Ferrari. On an often grueling, 15-leg journey, a team of forty-eight journalists took turns driving from Belo Horizonte in Brazil to the Argentinean pampa; over Andean plateaus and through mountain passes some 13,000 feet above sea level; through the Central American tropics and across Mexico and the United States , with a final stop in Canada before reaching the final destination in New York. Don’t miss this incredible 1:18th model!